A job search can wear on all of us, but it’s important to do things that help us stay focused and upbeat! Do you have the balance in your life? Keep a regular daily routine. The job search is our regular job now. Following a schedule will help us be more efficient and productive. Volunteer. Unemployment can cripple self-esteem. Finding a group or trade association to which we can contribute our time and expertise helps maintain a sense of value and purpose. It also provides social support and networking opportunities. Peers and colleagues we volunteer with will see us in action! Focus on the things we can control. As much as we might have been used to running things when working, we can’t control the world. Black holes, the lack of call backs and lengthy interview processes are the norm. Turn attention to things we can control – like setting up meetings with networking contacts, referrals and trusted friends. 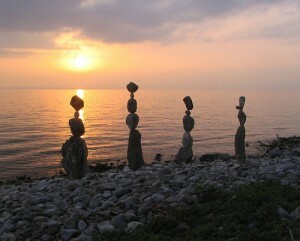 Maintain balance in our lives. Don’t let the job search consume us. Make time for revitalization. The job search will be more effective if we are at our best (mentally, emotionally, and physically). Make time for regular exercise. It’s a great outlet for stress, as well as a powerful mood and energy booster. Shoot for at least a half-hour of exercise most days. Eat well and get plenty of sleep. Sleep and good nutrition have a huge influence on our productivity and mood. Recharge the batteries! Practice relaxation techniques. Deep breathing and meditation are powerful antidotes to stress. Such techniques can help us stay calm and collected in challenging situations.